and caused the Seal of the Department of State to be affixed. And of the Independence of the United States of America the ninety-fourth. 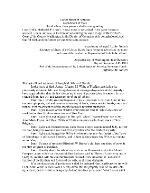 The last will and testament of Joseph M. White of Florida. ordain this my last will and testament revoking all others. money; with the exception of the specific legacies hereafter mentioned. stock in the New Brighton Association of New York. children, being the woman I received from my father after the death of my wife. children of the Brothers and Sisters of my wife, as she may designate. after the death of my wife. Given under my hand and Seal, at Washington September 28th, 1836. Washington County, to wit, December 18th, 1839.
original *** and recorded in my office. Witness my hand and seal of office, this 19th day of December in the year 1839. Ed: N. Roach Reg. Wills of Columbia. Washington County aforesaid do certify that the aforegoing attestation by Edward N.
credit are to be given to his official acts. Given under my hand and seal, at the City of Washington this 19th day of Dec.